The recently published report, Traditional IRA Investors’ Withdrawal Activity, 2007 and 2008, adds to the picture that has emerged about IRA savers—the data indicate that they tend to be careful savers, making mostly retirement-related withdrawals once they are older. Among other things, our report provides a view on how withdrawal activity and exact withdrawal amounts vary by investor age, income, and gender. For example, younger traditional IRA investors are much less likely to have withdrawals compared with older traditional IRA investors. Fewer than one in 10 traditional IRA investors in their early thirties took withdrawals in 2007 and the median amount withdrawn was $5,830. 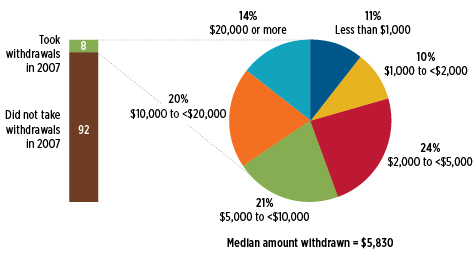 Household survey data indicate that younger individuals with withdrawals tend to take lump sums based on needs. These investors may be responding to economic stresses, taking advantage of exemptions from early-withdrawal penalties to buy a first home or pay for education, or taking withdrawals from inherited IRAs. Note: The sample is 378,800 traditional IRA investors aged 30 to 34 at year-end 2007, of which 29,100 took withdrawals in 2007. Figures 11, 17, 18, and 19 in the report provide additional detail. Withdrawal activity increased with investor age, in part reflecting the rules that govern traditional IRA distributions. About one in five traditional IRA investors in their sixties chose to take withdrawals in 2007. Nearly eight in 10 traditional IRA investors aged 70 or older took withdrawals in 2007. Household survey data find that these older traditional IRA investors typically take out just enough to meet the required minimum distribution (RMD) amount. Analyzing traditional IRA investors aged 72 or older who had accounts in 2007 and 2008, it is possible to determine whether the withdrawal amount was calculated to meet the RMD. Almost six in 10 traditional IRA investors aged 72 or older with withdrawals in 2008 took exactly the RMD amount, based on their year-end 2007 traditional IRA balance and the IRS Uniform Lifetime Table. The entire IRA Investor Profile series can be found at this resource page. The next installment in the series will examine Roth IRA investor activity. In recent years, the discussion around money market funds has been as intense as it has been varied. Regulators have contemplated a wide range of reform proposals, in turn inspiring scores of citizens, organizations, businesses, and government officials to weigh in and share their views. Floyd Norris’ column, “Money Market Funds and Their Allies Resist New Rules,” falls into the trap of concluding that money market mutual funds are banks. They’re not. A recent DealBook column about money market funds distorts the truth and omits essential facts. We’d like to correct the record and review a few key points that the DealBook author, law professor Steven M. Davidoff, seems to have missed.